The fixtures are out tomorrow morning. The Carling Cup 1st Round draw was made today. The Premier League released a list of free agents today with some ery big names on it. Before we know it, the new season will be here. Time for a new thread I suppose. JLP wrote: The fixtures are out tomorrow morning. The Carling Cup 1st Round draw was made today. The Premier League released a list of free agents today with some ery big names on it. Before we know it, the new season will be here. A couple of tasty little ties were thrown up, Notts Forest v Notts County & Ledds v Bradford. (All ties will be played during the week commencing Aug . This gives a nice detailed insight on how pitches are upgraded and or repaired during the close season. JLP wrote: This gives a nice detailed insight on how pitches are upgraded and or repaired during the close season. Meanwhile, DownUnder, another footy season is hotting up..... bring on those Tigers this weekend! Easily the most exciting game this season!! Almost as good as when the Bombers came from behind to beat the stinky Magpies in the 2007 Anzac Day Clash! Part of a stadium roof has collapsed in the Dutch city of Enschede, killing one person and injuring more than a dozen. 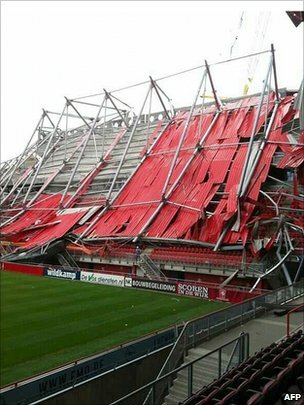 The accident happened during building work at the ground of top Dutch football team FC Twente. The victims are thought to be construction workers. JLP wrote: Hull and Barnsley were due to play Feyenoord in pre season friendlies but both games have been cancelled due to the threat of large scale disorder. What does that mean? fan protests ? more like trouble from Feyenoord fans. Nothing amiss at Hull to cause protests. Pity, it would have been nice to meet pre game. I really don't know why the games have been cancelled. I can only presume as it is both games, the problem is at Feyenoord's end. Of course that does not mean all travelling fans would have caused problems. Leicester are certainly going for it this season. Just signed Konchesky and are after Owen Hargreaves too. JLP wrote: Leicester are certainly going for it this season. Just signed Konchesky and are after Owen Hargreaves too.